The International Astronomical Union (IAU), the internationally recognized authority for naming celestial bodies and their surface features, approved names of 14 surface features on Pluto in August 2017. 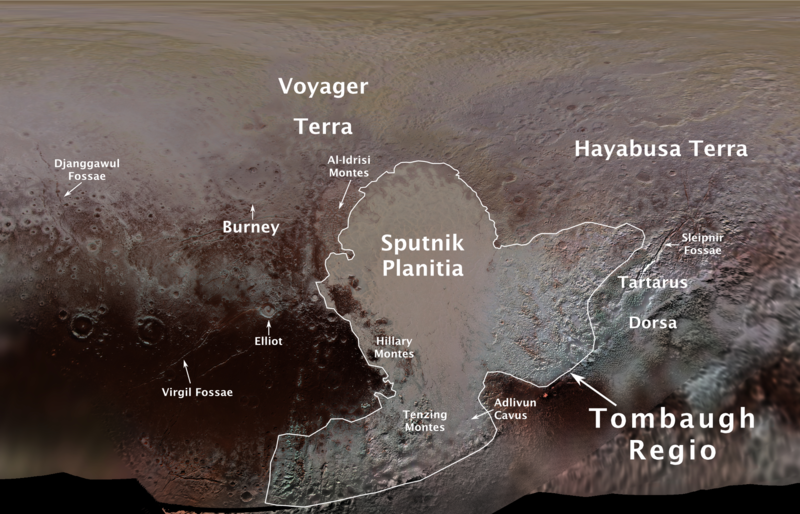 The names were proposed by NASA’s New Horizons team following the first reconnaissance of Pluto and its moons by the New Horizons spacecraft in 2015. Tombaugh Regio honors Clyde Tombaugh (1906–1997), the U.S. astronomer who discovered Pluto in 1930 from Lowell Observatory in Arizona. Burney crater honors Venetia Burney (1918-2009), who as an 11-year-old schoolgirl suggested the name "Pluto" for Clyde Tombaugh’s newly discovered planet. Later in life she taught mathematics and economics. Tenzing Montes and Hillary Montes are mountain ranges honoring Tenzing Norgay (1914–1986) and Sir Edmund Hillary (1919–2008), the Indian/Nepali Sherpa and New Zealand mountaineer were the first to reach the summit of Mount Everest and return safely. Elliot crater recognizes James Elliot (1943-2011), an MIT researcher who pioneered the use of stellar occultations to study the solar system – leading to discoveries such as the rings of Uranus and the first detection of Pluto's thin atmosphere.